The Saint Louis Art Museum’s new East Building is finished and will be the focal point of grand opening events this weekend. If you plan to attend, take advantage of the Forest Park Trolley during the day, then the free after hours Art Museum Shuttle, which will run every 20 minutes, connecting the Forest Park-DeBaliviere MetroLink Station with the Forest Park Visitors Center Parking Lot and the Art Museum from 7:19 p.m. to 10:29 p.m Saturday night (June 29). The festivities kick off at 9:30 a.m. Saturday with a ribbon-cutting followed by the day-long ‘World of Art’, an outdoor celebration of the expansion with hands-on art projects and musical performances scheduled throughout the day, as well as food booths in the east parking lot. 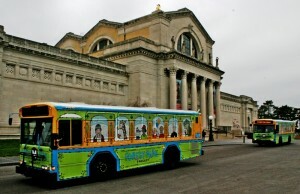 The regular Forest Park Trolley will take customers from the Forest Park-DeBaliviere Metrolink Station to the museum from 9 a.m. to 7 p.m. Saturday. Museum goers are encouraged to stay from 7 p.m. to 10 p.m. Saturday night for world-class jazz by Nicholas Payton, Phil Dunlap and others, a museum open house and more outdoor activities.